YESbonds™ should pay 250 basis points more than 10-year US Treasury Bonds, but can be constructed so that the interest rate floats up when the life insurance and the growth company loan performs. A separate SPV issues each YESbond. All Assets are domiciled in Ireland and held by a Trustee. (This is a settlement Industry standard practice). About half the bond proceeds are invested into life settlements (typically in twice as much insurance as the bond principal). 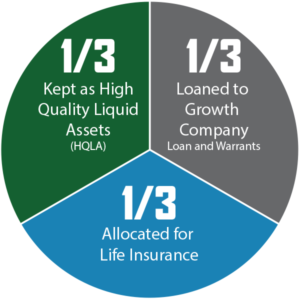 About one third to one half of the bond proceeds are invested into life settlements (typically in two to three times as much insurance as the bond principal). About a third of the principal is loaned to a selected emerging growth company. After paying fees, the rest of the bond proceeds are invested into High Quality Liquid Assets. A sinking fund retires the principal. We created YESbonds to fund exciting new companies that represent a significant positive step forward, both economically and for their positive effect on Humanity. We created this vehicle so that investors could have a safer way to stimulate the growth of these companies. Actuarial stress testing by top industry experts confirm that the cash-flow from the insurance contracts should retire the YESbonds even when the emerging company loan and warrants fail to perform.